In Southampton for a football match, crossing to and from the Isle of Wight, or meeting and greeting a cruise ship? Or in the city for business with a couple of hours to spare, or just touring? 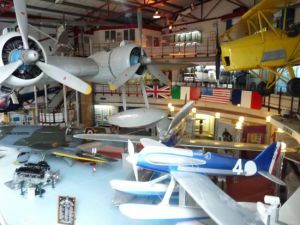 If you are interested in man’s quest to get into the air the Solent Sky Museum showcases the history of aviation in Southampton and the Solent. While Eastleigh Aerodrome (now Southampton International) is synonymous with the first flight of the Supermarine Spitfire, the Solent area has been involved with aviation since 1908, Supermarine of course, Saunders Roe with their series of flying boats, Britten-Norman also on the Isle of Wight and Folland on the Hamble. The Museum tells the story of 26 aircraft companies, including the largest flying boat operation in the world and in particular the legendary Spitfire designed by R. J. Mitchell actually in Southampton. Eighteen aircraft, or bits of aircraft are on display, including a one-time World Record Holder (332mph) Supermarine S6 of Schneider Trophy fame, and a cockpit section from the largely forgotten Supermarine Swift, also a World Record Holder (737.3mph). Dominating the whole exhibition is Short Sandringham VH-BRC, there is the enviable Spitfire, but arguably the most interesting and unique aircraft is a Supermarine S6a, also designed by the legendary R. J. Mitchell, part of the learning curve for the Spitfire. The 1942 film, in black and white, “The First of the Few” tells his story. The Spitfire flying sequences actually took place from RAF Northolt. The Schneider Trophy contest was instigated by Jacques Schneider in 1913 in order to promote the use of water-borne aircraft. The Trophy was contested again after the 1914-1918 war every two years until being retained by Great Britain in 1931 when in compliance with the rules it was won on three consecutive occasions by the same country. This S6 aircraft was built in 1929 for the contest, flown in September of that year at Calshot at the entrance to Southampton Water. Damaged in a landing accident it did not actually compete and was displayed for many years on the Royal Pier at Southampton. Inevitably the aircraft was powered by Rolls-Royce, this time the specially designed for air racing R series, 37-litre (2,240 cu in) capacity, supercharged V-12 capable of producing just under 2,800 hp (2,090 kW), and weighing 1,640 pounds (770 kg). It was also used for Sir Donald Campbell’s Bluebird water speed record holder. On the ground floor there is a short video presentation of the Schneider Trophy. In clipped Pathe News style English it is very worthwhile resting for 10 minutes. The Supermarine Spitfire is one of the most famous and iconic aircraft of all time. The prototype first flew on the 5 March 1936 and the aircraft subsequently went through many design changes culminating in the Mk 24. The Spitfire was powered initially by the Rolls-Royce Merlin but many of the later versions had the Rolls-Royce Griffon engine with a total of 22,000 plus of all marks of the aircraft having been built. The Spitfire Mk 24 in the museum first flew in 1946 and never saw combat. It is powered by a Rolls-Royce Griffon engine fitted with a five-bladed propeller. The aircraft was armed with four long-barrelled 20mm Hispano cannon. It was one of the last Spitfires built. 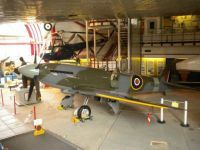 Throughout the Museum there are archives and memorabilia devoted to the Spitfire. It is probably the world’s greatest collection. With her Empire spread throughout the seven seas it was inevitable that Great Britain led the way with the development of flying boats, first for the military, and later for commercial use. It was an effective way of linking the mainly waterside chief cities, typically Rose Bay in Sydney and The Gateway to India at Bombay (now Mumbai). Initially based in Rochester, Kent, Short Brothers were the world leader for waterborne air transport. Southampton, with its quick rail link to London and the usually smooth Solent was the ideal base for operations. Imperial Airways was the operator and for a very short time BOAC. The aircraft on display started life as a Short Sunderland Mk III and was delivered to the RAF with serial JM715 on 8 July of that year but saw little war service. In 1947 Short Brothers at Belfast converted it into the Sandringham 30-passenger version and she went to work ‘down under’ finally operating the Ansett Sydney – Lord Howe Island service before finally being withdrawn in 1974 and subsequently acquired by Charlie Blair of Antilles Air Boats Inc, husband of film actress Maureen O’Hara (who happens to be 95 today 17 August). Captain Blair was famous for landing a Pan American 314 flying boat at New York’s La Guardia airport with virtually zero fuel. It stalled on taxiing in. 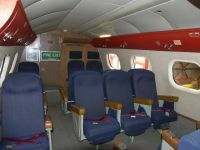 With Antilles 41 seats were fitted. Climbing on board the aircraft what is apparent is the amount of space available for passengers. With four Pratt & Whitney Twin Wasp radial piston engines it is impossible to gauge the noise levels, but ear plugs must have been in the amenity kit. 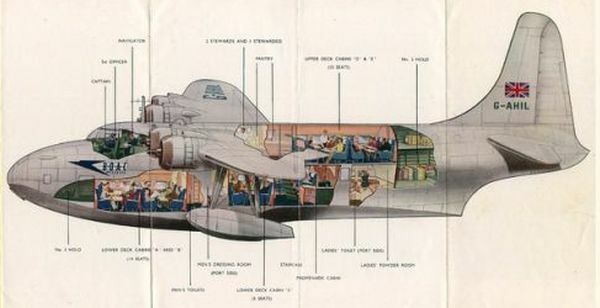 It was the A380 of its day, the Imperial Airways/BOAC version with the rear upper deck kitted out as a bar and lounge. Here is a tiny galley in which the two stewards managed to prepare some sumptuous meals. The flight crew was five (two pilots, navigator, and radio operator with the flight engineer in a separate compartment behind the flight deck opposite crew rest berths). The main deck is divided into four cabins and in some ways looks more like a plush railway carriage of the time, with net storage areas in the roof. Passengers arrived by Pullman car trains from Waterloo and were accommodated in the South Western Hotel before embarking the next morning. A journey to Sydney would take up to 10 days at 160 mph and numerous stops. But a wonderful low level view of the world. After the death of Captain Blair in a flying accident in 1978 it eventually was acquired by the Science Museum and on its final landing at Calshot had acquired 19,500 hours. Other aircraft well worth looking at in the exhibition include a Folland Gnat jet fighter, part of the original Red Arrows team, Saunders Roe SRA1 waterborne jet fighter, the very first Britten-Norman aircraft (BN 1F), De Havilland Vampire and Sea Vixen, and the Mignet Flying Flea, a homebuilt French design whose history is something of a mystery (as is its reason for being in the Museum).